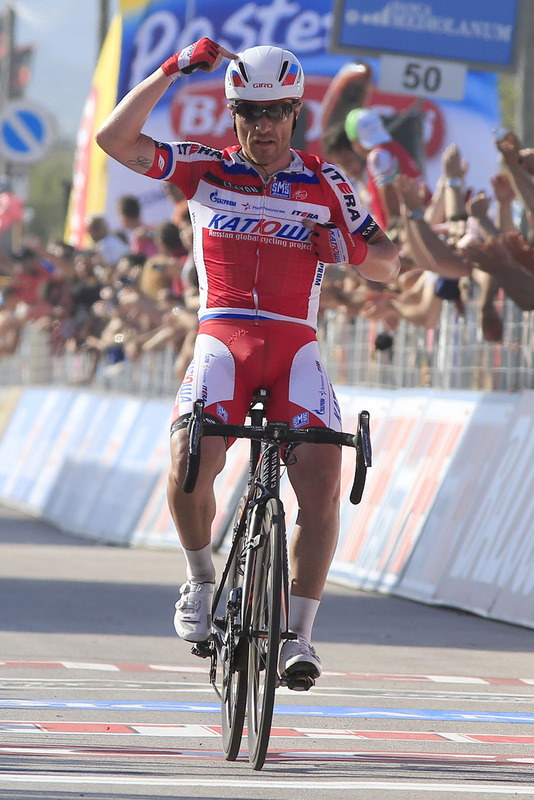 Luca Paolini (Katusha) won the third stage of the Giro d’Italia, also claiming the maglia rosa after a late attack at the end of an exciting 222km race to Marina di Ascea. Britain’s Bradley Wiggins (Sky) remains second overall and 17 seconds down on the new race leader with Sky teammate Rigoberto Uran currently third in the same time. The 36-year-old Paolini, in his Giro debut, made a late attack within the final 10km to celebrate a solo victory finishing 16 seconds ahead of Australian Cadel Evans (BMC) who won a small group sprint from defending champion Ryder Hesjedal (Garmin-Sharp), who was third. Evans and Hesjedal, importantly, picked up times bonuses with their respective efforts after disappointing runs in yesterday’s team time trial. Hesjedal was extraordinary in the closing stages of the race from Sorrento. On the Sella di Catona the Canadian attacked and in doing so forced a major selection on the technical descent that also played host to minor crashes. Some pundits on social media questioned the tactic – that insiders later deemed purposeful. 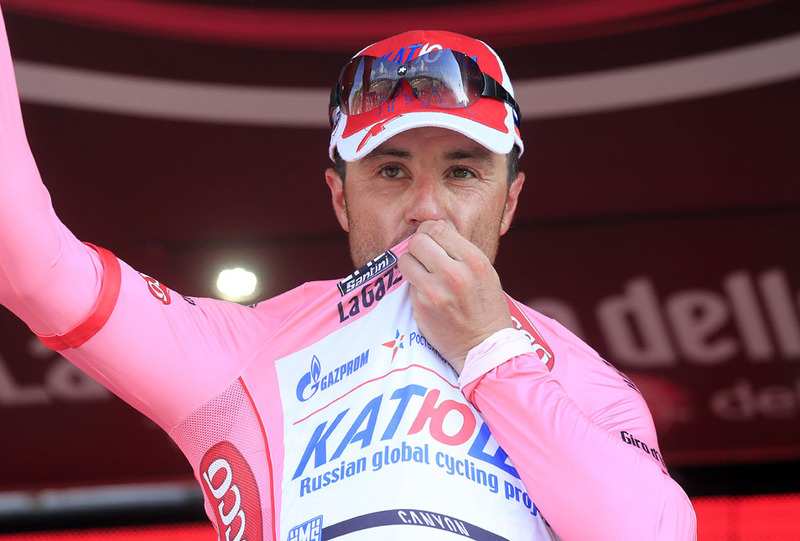 Regardless, it lit-up the stage, forced overall rivals to chase, and very early in the first Grand Tour of the season. A seven-man break including Fabio Taborre (Vini Fantini-Selle Italia), Manuele Boaro (Team Saxo-Tinkoff), Willem Wauters (Vacansoleil-DCM Pro Cycling Team), Jarlinson Pantano (Colombia), Bert De Backer (Team Argos-Shimano), Dirk Bellemakers (Lotto Belisol) and Jackson Rodriguez (Androni Giocattoli) marked the main break escape of the race, getting away in Sorrento. The group achieved a maximum time advantage of around six minutes before teams including Sky and Omega Pharma-Quick Step moved to the front to close the gap. The break began to splinter, with De Backer spat out the back, on the first of the two defining climbs of the stage where sprinters initially lost contact. 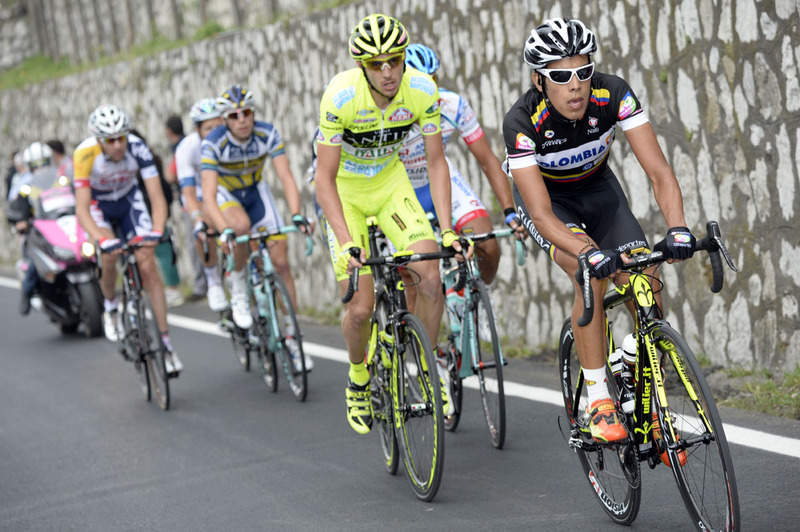 As the time advantage whittled down Taborre surged off the front but ultimately to no avail. Garmin-Sharp came to the fore within the final 30km were Hesjedal then accelerated. It forced a small group of some 20 riders, including Wiggins, to bridge across. Already the overall classifcation has started to take shape after just three days of racing.